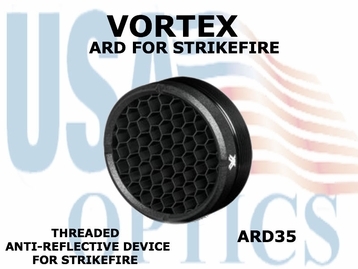 ARD FOR STRIKEFIRE Reduce objective lens glare and reflection on any threaded StrikeFire red dot scope with this compact, anti-reflection device (ARD). In addition to reducing reflection, the threaded ARD protects the len from scratches and damage. To add or remove the ARD: Remove the flip cap from the StrikeFire. Thread the ARD into/out of the objective lens barrel. Push the flip cap back onto the StrikeFire.